My latest Vinyl Anachronist column for Perfect Sound Forever is now online at http://www.furious.com/perfect/vinyl103.html. This one is an interview with Jim Pendleton, maker of the Audio Intelligent LP cleaning systems. Enjoy! Retro-soul, neo-soul and soul revival are the latest tags for new musical groups that sound like they're auditioning to replace the latest incarnation of the SNL house band--big, brassy horns, heart and iron, and a big debt owed to the '70s blues-rock scene in American cities such as Chicago and Detroit. With most retro movements, the trick is to fully saturate your sound with said genre and throw in what I like to call "winks" to the audience by offering subtle clues that this is a knowing homage and not another mere cover band. Some performers--Sharon Jones and the Dap-Kings immediately comes to mind--take the higher, purer road and commit to the "lost classic" motif and sound like they teleported themselves to the present from a Motown studio circa 1966. The Get Ahead, a five-piece outfit from Portland, is a no-nonsense example of the latter--this is music meant to be experienced live and sweaty and doused with stale PBR. There is no filter, no hidden layer, that acknowledges the years since Delanie and Bonnie player at Fairfield Halls. 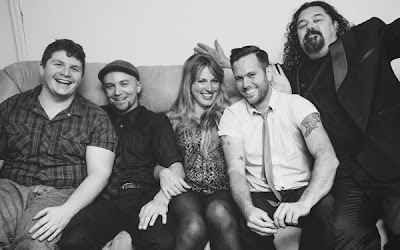 This is blues rock that is full speed ahead and unapologetic about it. The true virtue of The Get Ahead, and the reason why they shouldn't be easily dismissed as a party band, lies in the vocal talents of Juliet Howard and Nathan Earle. Their voices, constantly trading off with each other, have the gruff tenderness this type of hallowed music needs, and the confidence to deliver it like they've been singing together since SNL's first season. The remaining members--drummer Danny Johnson, bassist Sean Farrell and saxophonist Steve Johnson--all have that raw yet professional delivery that marks the signatures of the best session musicians from 30 or 40 years ago. They're students, and they've been studying all night. They're not zeroing in on the secrets of the universe, unless that secret is dancing and having fun with a big, happy crowd of like-minded people. Then again, what's wrong with a party band? You need something to play at the next party, something cool and assured and genuine yet unique enough to make your guests approach you and ask, "Who is this?" Recently we had some friends over and of course I was asked to fire up the magical CCI music machine. It's something I'm hesitant to do since someone always has a lame objection to my musical choices or, even worse, they make a completely ludicrous request based on today's Top 40. 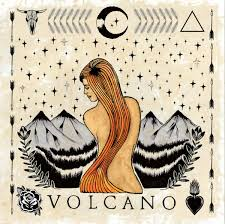 Put on something universally cool such as Volcano, as I did that night, and everyone eventually trussts you and stays out of your way. 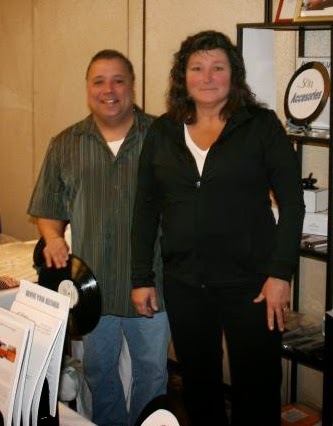 I just received an email from Donna Bodinet of SOTA Turntables--her husband and business partner Kirk Bodinet passed away this last Monday, March 23. I've been working with the Bodinets over the last few years--we did a room share at AXPONA a couple of years ago, I interviewed them for Perfect Sound Forever, and I reviewed their LP RCM record cleaning machine for Positive Feedback Online. Both Kirk and Donna are wonderful, kind and down-to-earth people who took a respected yet defunct brand, resurrected it and returned the SOTA name to the iconic status it deserved. Kirk was responsible for designing both the entry level Moonbeam and Comet turntables--my current choice for the best affordable turntables on the market. Donna says that the future of SOTA Turntables is safe, but Kirk's passing leaves a big void in the world of analog music reproduction. I wish the best for Donna and her wonderful company in the years ahead. I've just written my first cigar-related article, albeit for an audio publication: I introduce The Smoking Jacket, my new ongoing column for Part-Time Audiophile. You can read it right here. This came about last month, when Part-Time Audiophile debuted a new column, The Reluctant Sommelier. It's written by Nina Sventitsky, who is both the Secretary General of the North American Sommelier Association and a partner in WyWires, a high-end audio manufacturer specializing in cables. I joked with Scot Hull of PTA by asking what was next, "The Recalcitrant Cigar Smoker"? His response was something akin to, "Well, are you up for it?" So I gave it a shot. I certainly don't have Nina's credentials. I owned a cigar lounge for a few months and I've been smoking them for nearly twenty years. I'm just someone who's standing at the intersection of two hobbies. I have so many cigar buddies in the high-end audio industry, including the aforementioned Mr. Hull, so I know there's an interest. I have a lot of things to talk about, and as a layman I welcome any professional insight from my many friends in the premium cigar industry. Every time I exhibit at a high-end audio show I try to purchase at least one demo-quality disc, be it CD or LP, so I can play something fresh and new for show attendees. Usually I can sneak down from my room at some point during the show and head for the ballroom where multiple vendors are selling music and accessories in the big open marketplace downstairs. Occasionally I luck out, as I did at RMAF a couple of years ago, when Final Impression Music had a room right down the hallway. During every lull, I'd run over and pick up a disc or two. That was when I picked up such great FIM demo discs as Happy Coat and Best of Play Bach. I'll also check out Chad Kassem's booth for Acoustic Sounds--especially if I'm playing vinyl at the show and I need one of his awesome remasters from Analogue Productions. At CES, however, I'm usually out of luck--retail sales are not only discouraged, but they're actually against the rules. (I haven't actually seen this rule anywhere, but I've been told of the dire consequences of ignoring it.) That's why I was so surprised and grateful that Mobile Fidelity had a room down the hall from me during January's show, a room so thoroughly stocked with MFSL LPs and CDs that I almost started to hyperventilate. (I apologize for not having the foresight to snap some photos while I shopped around, but it was stupendous to see.) 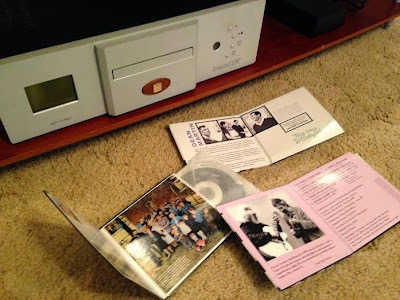 I wound up purchasing three fairly new MFSL CDs, or at least three MFSL discs I've never seen before--The Band's Music from Big Pink, Dean Martin's This Time I'm Swinging and the famous 1991 audiophile extravaganza Jerry Garcia/David Grisman. I chose the discs for one reason or another--my only LP copy of Big Pink isn't quite the cleanest record I own, I've been on a Dean Martin kick lately and I really wanted to wow attendees with a realistic rendering on his voice, and the Garcia/Grisman disc was purchased just because I wanted a guarantee of an awesome demo disc. Unfortunately, only the former disc was used consistently at the show due to its sonic qualifications. The Dean Martin sounded clean and vibrant, but the recording was severely lacking in deep, deep bass; I don't have a copy of the original to compare. Big Pink sounded great compared to my old grungy LP--the imaging and the space between the musicians were more focused, and I could hear recording artifacts that were buried deep in the recording. But again, the lack of deep bass was problematic, and I was playing through a pair of loudspeakers that were flat down to 32 Hz and weighed 200 pounds each. That kind of brings me back to my feelings about MFSL in general. I love 'em, no doubt about it. I still have time travel daydreams about going back to my local Tower Records in Buena Park, California, circa 1979 or so, and buying up all those sealed UHQRs on that 50% off clearance endcap. My first audiophile LP pressing was MFSL's Crime of the Century from Supertramp, and I remember being startled listening to that opening harmonica from "School" through a system that included a Sansui 8080DB receiver, a Dual 510 turntable with a Shure V-15 Type III cartridge, all running through a pair of the then ubiquitous Sennheiser HD-414 headphones. I still use the MFSL LP of Dead Can Dance's Into the Labyrinth as one of my most impressive demo discs. But here's the thing--over the years I've felt that MSFL's mission wasn't to make extraordinary sounding discs that blew your mind, but to make poor recordings sound relatively reasonable for the first time. So it is the case with these three particular discs. But my main concern is with this missing bass on the latest Ultradisc releases. I've listened to these three recordings on a variety of systems, including my main headphone system, and I really wish there was a bit more of a solid foundation under these otherwise brilliant remasters. MFSL is releasing so many new titles these days, which is certainly a good thing. But I do miss the days when MFSL consistently offered the best-sounding versions of popular albums. With competition from so many great audiophile labels, I think it's time for them to come up with a new benchmark for performance.